GPS to Park: If you prefer, you can use GPS to Ed Levin Park. But, do not just enter Ed Levin Park, Milpitas. Instead, try either Sandy Wool Lake, Ed Levin Park, Milpitas, or Hang Gliding or Paragliding area at Ed Levin Park on the GPS. It will never hurt to have the directions below printed out. Many pilots have tried GPS and ended up at the wrong part of the park and there is not much cell signal there. 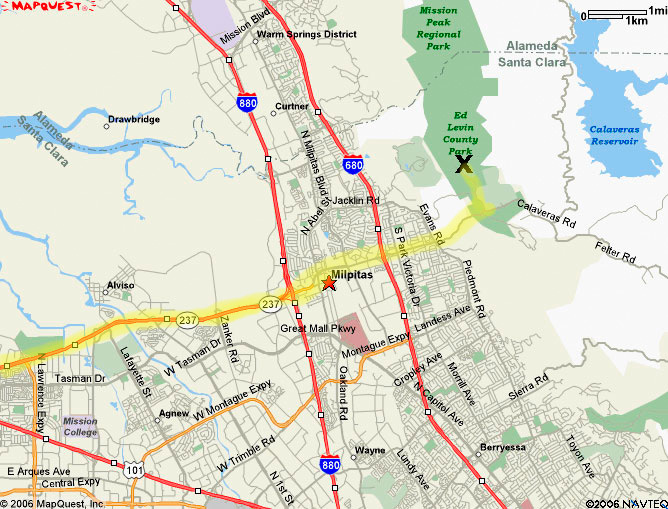 From 101 heading North or South: About 27 miles South of San Francisco International Airport, at hwy 101 in Sunnyvale, take the Hwy 237 Milpitas /Alviso Exit and head East. Continue East on 237 about 9 miles to the exit for Calaveras Rd or Blvd. Calaveras Blvd will turn into E. Calaveras Rd. Continue on this east until it starts to wind into the hills. About 1/2 mile up, you will turn left onto Downing Rd. into Ed Levin Park. Just after this, veer right and you will pass the Day Pass station ( you will pay about $6.00 for a day pass here ). Continue into the park, past Sandy Wool Lake and look for the parking lot (just in front of the large lawn area, at the north end of the park). Park in the paved parking lot and we meet at the north end. From the East Bay depending on your location take either Hwy 680 or 880 (Calaveras Blvd.) to Milpitas and take the Hwy 237 Exit (aka Calavaras Blvd. from 880 – Not Old Calaveras! —- from 680 it is called Calaveras Rd). Head east through the town of Milpitas. until it starts to wind into the hills. About 1/2 mile up, you will turn left onto Downing Rd. into Ed Levin Park. Just after this, veer right and you will pass the Day Pass station ( you will pay about $6.00 for a day pass here ). Continue into the park, past Sandy Wool Lake and look for the parking lot (just in front of the large lawn area, at the north end of the park). Park in the paved parking lot and we meet at the north end.